Want to Know Where to Stay in Hamburg? We’re Here to Help! Wondering where to stay in Hamburg? Truth is, there is no one best place to stay in Hamburg since each area offers a unique side of the city. The German port city is loaded with amazing areas, so we’re pretty sure that you will find a neighbourhood and place to stay that you love! We really like Hamburg – Lisa (being German) had been a few times but we got the chance to explore the city together early on in our wanders. What a great city. There are lots of cool places to stay in Hamburg – from student areas and trendy districts to seaside areas with great architecture. Defining the best neighbourhoods in Hamburg really depends on what you are looking for! 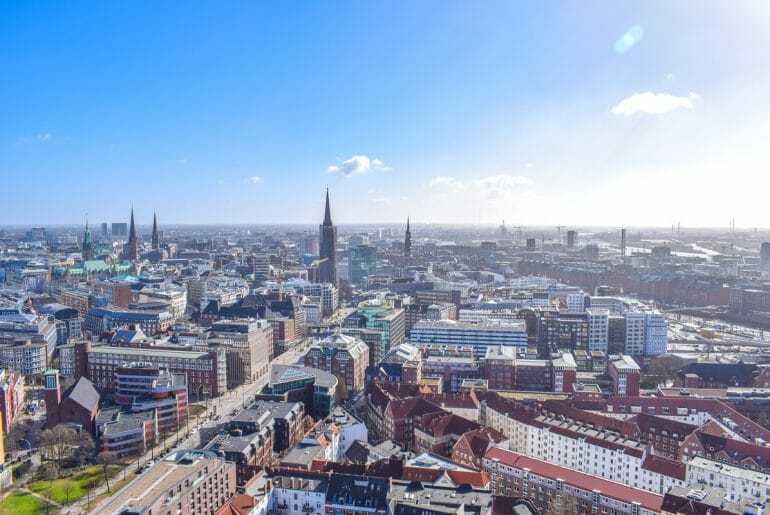 In this guide, we outline some of the best areas to stay in Hamburg – in our opinion. We’ll walk you through what you can find in each one, the safest areas, and provide examples of places to stay in each. Whether you are stopping through for a city adventure, a relaxing vacation or a fun stag do – we’ve got you covered! Hamburg, like many other large German cities, has lots of different accommodation options that suit all budgets, group sizes, and reasons for travel. That said, there are lots of different areas which – generally – have more of one kind of accommodation to offer. For example, the Altstadt (old town) has more hotels while St. Pauli has more budget accommodation – but this isn’t a strict rule. We will get into the areas further down, though. Below, we outline the different styles – from hotels to bed and breakfasts – and tell you what to expect if you book that type in the city! As a large and popular place to visit, there are hotels scattered across the whole of Hamburg. The difference between them is the areas they are in. There are luxury hotels up by the lake in New Town (Neustadt) and there are budget hotels down by the ports near St. Pauli. To keep this brief, Hamburg has loads of hotels for all travel styles, location preferences, and budgets. If you want a hotel for your Hamburg trip, you can check here for hotels to get started! You could also very well just keep on reading below to learn about specific hotels in great areas around Hamburg. If you are travelling on a budget or you’re a solo traveller looking to connect with other travellers passing through the city, you should stay at a hostel. Like with hotels, there are plenty of hostels in different areas of the city to suit different styles. You will find brand names like Generator and Meininger as well as boutique hostels in the Schanzenviertel. Keep in mind that if you are coming to Hamburg for a stag do, hostels generally have a group size limit OR a flat-out ban on stag dos. Just something to watch for when you are looking. You can check here for great hostels in Hamburg to find a hostel that works for you. If you are looking for your own space for a group, family, and/or to prepare your own meals (to save money), you might look into renting an apartment or an aparthotel. You might even look into an Airbnb. 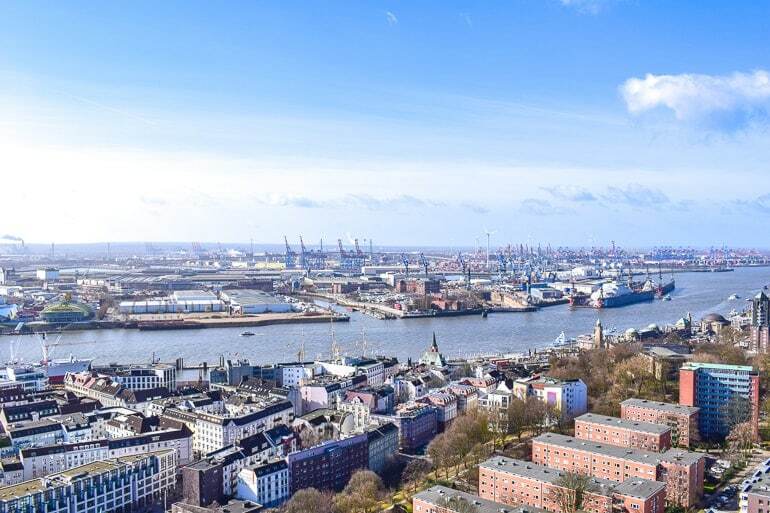 Hamburg is a larger city and there are certainly apartments available in the city centre and in places like Hafencity. You can even find aparthotels (a mix of full-service apartments with a hotel-style reception and food service). We obviously understand why you’d be looking for an apartment (we do the same in certain locations) but we usually try to avoid staying in apartments in bigger cities due to the debate over housing shortages in some major cities and the role holiday apartments play in that. That said, if you are staying for a few days and want your own space to cook and relax, you can check here for apartments and aparthotels in Hamburg. Alternatively, you can also look into Bed and Breakfasts (see below), or renting an extra room in someone’s apartment (this can be done via Airbnb as well) – we have done that a few times before. Even though it’s the second largest city in Germany, there are actually a handful of traditional bed and breakfasts scattered around the city. You might also find them called guesthouses. Either way, these cozy accommodations can allow you the comforts of home while staying in the big city. Generally, they come with kind hosts who generally have all sorts of great information about their city (and often a nice cooked breakfast). You can check here for bed and breakfasts in Hamburg! Below, this map of Hamburg covers some of the best areas to stay. The General Rule of Thumb: Hotels closer to the city centre and the water are generally more expensive. That said, this isn’t always the case in Hamburg – and you CAN find cheaper accommodation without completely sacrificing location. If getting around Hamburg is something you think about, you should know that Hamburg is a very flat city in the centre area. However, there are lots of steps, walkways, and bridges in other areas which can pose a challenge for those with limited mobility. Of course, if you choose to stay further out from the city centre or want to visit attractions on the outskirts, you can take Hamburg public transportation (subway “U-Bahn”, above ground trains “S-Bahn”, buses, and even ferries) to easily get to and from the city as well as around the city centre. First off, let’s just say that Hamburg is generally quite safe to visit. Of course, you have to watch your pockets in touristy areas or when taking photos but this should be standard practice for any traveller in bigger cities. In short, Hamburg is very much a city of neighbourhoods that have distinct “flavours” so getting your accommodation choice wrong and staying somewhere that doesn’t suit you can be worse in Hamburg compared to other cities. Now, lots of people ask about the “unsafe” areas in Hamburg and there’s a bit of a misconception going around. The area of St. Pauli is known to be rowdier, crazier, and “seedy” given that’s where the cheap bars and red light district are. However, it’s quite safe. There’s a difference between being “not for everyone” and being “unsafe”. If you are not looking for that in Hamburg, don’t venture through. There are plenty of amazing areas better suited for you! 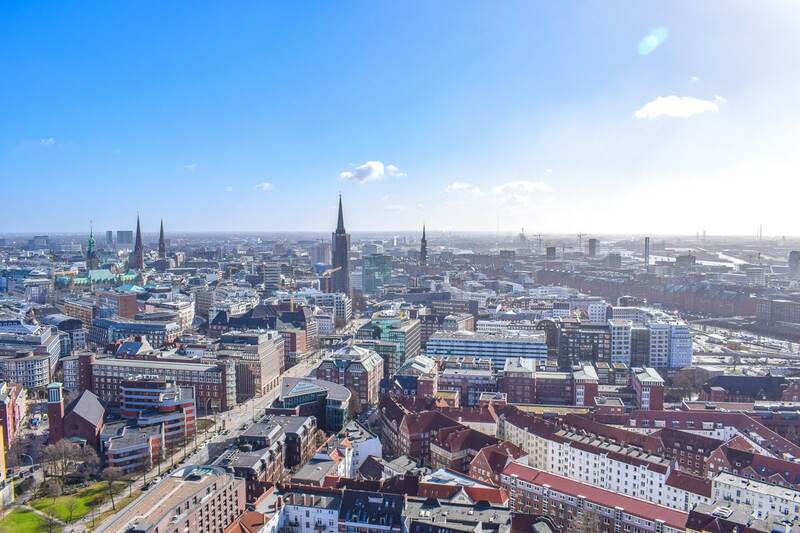 Alright, so now that we’ve discussed the different types and styles of accommodation in Hamburg, it’s time to dive into the best areas to stay in Hamburg! Corresponding with the map above, we’ll describe each area (and what you can find there for attractions) then we’ll tell you about some of the best accommodation choices. 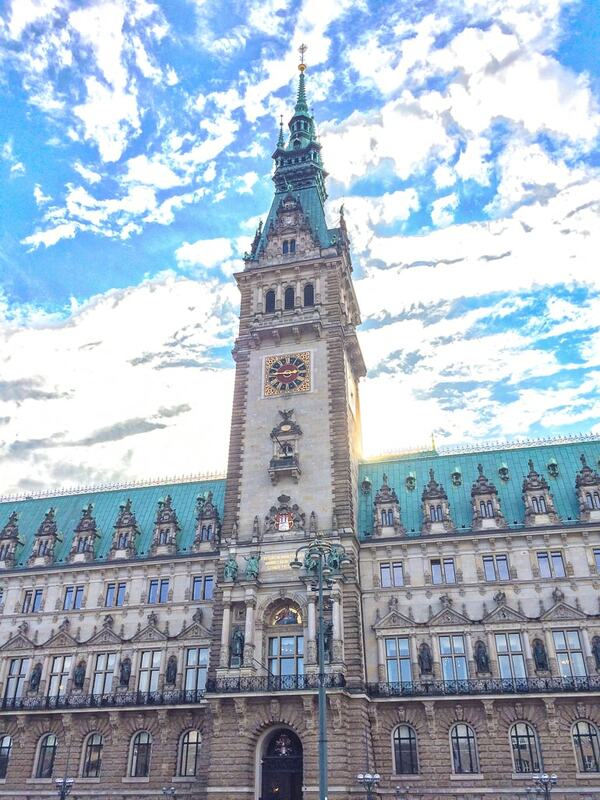 Just so we are clear – this post is not intended to include ALL the areas you could stay in Hamburg – just a few of the most important/popular/interesting ones! The Rathaus at the centre of the city – and the Old Town! If you want to stay in the centre of the city, look no further than the Altstadt (Old Town). The Old Town is a great location because you can easily get to any of the other districts via transit or just walking. That said, the central train station is close by if you stay here. Its borders are loosely defined by New Town (Neustadt) and the lake to the north, the central station to the east, and the waterfront/Speicherstadt to the south. Besides beautiful old churches and architecture, the area is a hub for shopping – with shops along Mönckeberg Street. It’s certainly more expensive to stay here – but you pay for the amazing location and the views out over the various waterways of Hamburg. There are top attractions like The Town Hall (Rathaus), St. Nikolai Memorial, many churches, and the lake (Binnenalster). We once sat in the Town Hall square on a sunny day and ate fresh fries from a local vendor. It was awesome! You can search for accommodation in the city centre/Old Town area here. Below are three featured properties for you to check out! If you are looking for a lively place to go for drinks or a place with great cafes and patios, St. Georg is for you. The area is defined by the central train station to the west, the upper lake (Außenalster) to the north, and train tracks to the south, and a road called Sechslingspforte. It’s a smaller area with not a ton of main attractions (besides the Mariendom) – but the place to be is Lange Reihe (a street) with over 700 bars, cafes, restaurants, and shops. It’s also the home Hamburg’s LGBTIQ community and as such the area had a very welcoming atmosphere. Conveniently, St. Georg is just a quick walk to the Old Town, Speicherstadt, or transit to get to other farther places. Another highlight of the area is the fact that there are lakefront trails and green spaces which are super tranquil. In St. Georg, you get a lively, trendy atmosphere with the ability to escape into nature as well! You can search for accommodation in the St Georg area here. Below are three featured properties for you to check out! There’s the Mövenpick Hotel – the cool looking red brick building! Sternschanze – a young, hip, area in the city’s northwest corner – is sometimes also called Schanzenviertel or even just “Schanze” (as told by the locals). You can find it just north of St. Pauli – making it a quick walk to one of the city’s most lively areas. Named after fortifications to keep the Danes out centuries ago, the area became full of old buildings that should have been torn down. Instead, the area has gone through intense gentrification over the years. Now, Sternschanze is Hamburg’s centre for “counter-culture” with graffiti-laden alleyways, thrift shops, vinyl record shops, and pop-up cafes around every corner. There aren’t a ton of attractions in the area – except for the Rote Flora cultural centre and the Schanzenturm (the old water tower turned hotel you can stay in – see below) – but the area itself is the attraction to check out. When we visited Hamburg, we had a wander around the area and even stopped into a few cafes, shops, and had dinner there. We really liked it! You can search for accommodation in the Sternschanze area here. It’s generally a little cheaper than places in the centre so below are three featured properties for you to check out! Location: Right in the heart of Schanzenviertel, great for shop, cafes, etc. A shot of New Town and Old Town from St. Michael’s Church.. with Speicherstadt area to the right. From new architecture to old churches, canals, and shopping, New Town (Neustadt) has a little something for everyone. This great area is located in the heart of the city centre – just north of the Old Town and south of the inner city lakes (Binnenalster). This is an area of the city with the canals running through which makes for great photos and a nice stop at canal-side cafes or terraces. You might find Jungfernstieg – the main promenade of the area that faces out over the Binnenalster. We had a wander through where the main shops are and even stopped in for a coffee at Public Coffee Roasters (which we loved). The area extends all the way down to the riverfront, passing many attractions on the way from the centre. You can find attractions like St. Michael’s Church (with an amazing tower climb for great views of the city – see the above photo), Großneumarkt Square with market stalls certain days of the week, and with museums like the Museum of Hamburg History (which is technically in St. Pauli area but close enough) and the Rickmer Rickmers (tall ship) down at the waterfront. The area is pretty spread out but is well-connected via transit. It is generally more expensive to stay in but you pay for prime location! You can search for accommodation in the Neustadt area here. Below are three featured properties for you to check out! The red brick and glass windows on the right belong to the AMERON Hotel! If you wanted to snap that classic Hamburg photo of the red brick warehouses and the waterways, this would be Speicherstadt. Better yet – you can stay here! Along with the new development close by called Hafencity, this waterfront area makes a great place to stay in Hamburg. Now, truthfully there aren’t a ton of accommodations in the area but the hotels that are around are excellent. We once stayed in Hafencity and loved the walk to the city centre each day. Even just a wander through the area is cool enough. Hafencity has some great restaurants and patios to enjoy, too. Aside from the great photographs, the area had a bunch of top attractions like: The Miniature Wunderland, Hamburg Dungeons, The Internationales Maritime Museum, and, of course, the Elbphilharmonie (famous Concert House). The area close to the Concert House is especially nice as it overlooks the city’s shoreline to the west. You can search for accommodation in the Speicherstadt/Hafencity area here. Below are three featured properties for you to check out! Here is the St. Pauli waterfront area – Hotel Hafen Hamburg is the tower on the right side of the photo! If you are heading to Hamburg in search of fun, then St. Pauli might be the area for you. 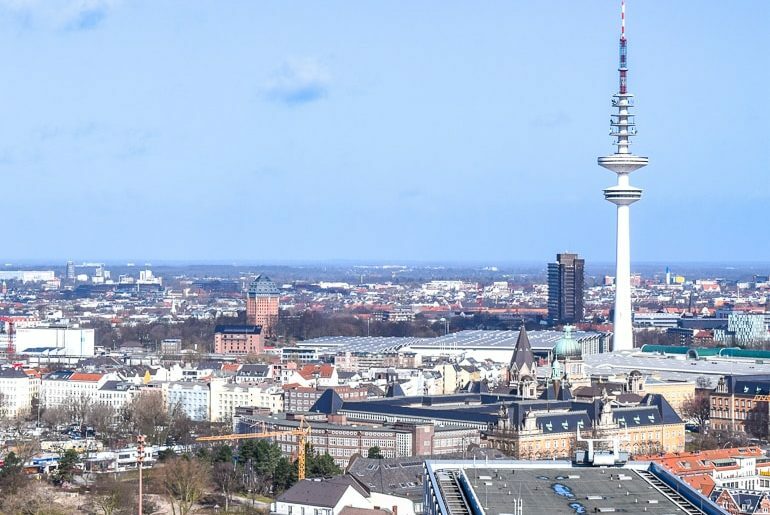 Bordered by the fishing area of Altona to the west and Neustadt to the east, the St. Pauli area is known for the football (soccer) club, the waterfront harbour area, and the Reeperbahn for nightlife. However, most know St. Pauli for the wild side. Reeperbahn (a very long street) is full of clubs, bars, theatres, live music and theatre venues, the city’s red light district, loads of lights, and colourful characters. It should be noted that there are still good bars, quieter restaurants, and cafes along side streets and the Elbe harbour area. 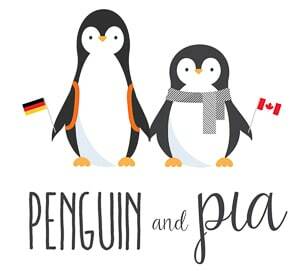 You can visit attractions like Reeperbahn, Beatlesplatz Square (because the Beatles played there in the very early 1960s), the Panoptikum (Germany’s oldest wax museum) and Planten un Blomen (a large park full of things like ice skating, fountains, and Japanese gardens). The area is also home to many festivals throughout the year – like the Reeperbahn Festival in September for live music! Despite how popular the area can get, accommodation can still be relatively cheap compared to the centre. You are still well-connected to other parts of the city via transit but the waterfront is a nice walk back towards New Town, Old Town, and into Speicherstadt. We did that walk and loved it. You can search for accommodation in the St. Pauli area here. Below are three featured properties for you to check out! If you want to get out of the hustle and the bustle of the city, you can head west of the city centre to the affluent area of Blankenese. This residential area along the River Elbe is known for its old fisherman houses that line the green hillside. In fact, there are over 5,000 steps in the area! One notable area, Treppenviertel (means Stairs Quarter), is known for its winding alleys and staircases. There are many restaurants and beer gardens in the area – especially at the top of Süllberg hill. While you can walk along the main waterfront (there are paths and a beach), to the west of the main town area is Falkensteiner Ufer beach which offers visitors a quaint, sandy place to relax. The area also has an S-Bahn stop (Blankenese) so once you hop on the train you can be in the city centre in about 25 minutes. If you are staying in the centre, this makes Blankenese a nice half-day trip. That said, if you are renting a car as you travel through Germany and stay in Blankenese, you could very well drive to the centre and back each day if you wanted. There are plenty of options to get back and forth. You can search for accommodation in the Blankenese area here. Below are two featured properties for you to check out! 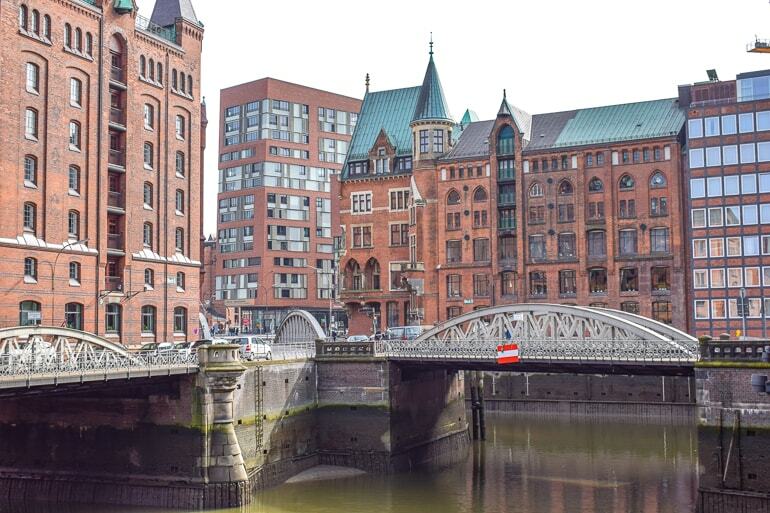 And there you have it – a rundown of where to stay in Hamburg. As we said, make sure you do your research before you book anything. There are loads of great areas to stay in but not all of them are for everyone! Have fun exploring the port city – and let us know where you end up staying!